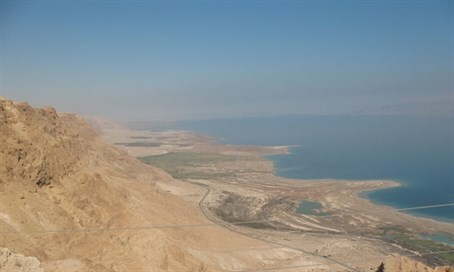 Geological survey confirms presence of oil deposit north of Israeli side of Dead Sea. Value estimated between 1.2-1.8 billion shekels. Surveyors struck oil in Israel, with an oil deposit discovered near the Dead Sea. On Sunday the Hatrurim consortium, named for the Hatrurim formation in the Dead Sea area, announced that a report from the Dunmore Consulting company had confirmed the presence of an oil reservoir in an area under license by Hatrurim. A geological survey conducted at the Halamish drilling site, located within Hatrurim’s 94 square kilometer (36 square miles) license, estimated that there was between 7 and 11 million barrels of oil in the deposit, worth some 1.2 to 1.8 billion shekels ($316 - 474 million). The Hatrurim license area was first surveyed in 1995, when the Delek Group carried out the first drilling in the area. Despite evidence of oil, follow up operations to confirm the presence of a oil deposit were not conducted for more than 20 years.